This is Shay. She's one of my favorites. My inspiration for her? She's a city girl. You might find her in New York, maybe San Francisco. Her hat, heels and clutch say it all...she's into clothes and she knows how to wear them! This stamp goes perfect with the Boutique stamp pack consisting of hats and handbags. Accessories always makes playing dress up a lot more fun, don't you think? She looks really beautiful Julie and I can see her strolling in Paris too and she looks very chic. I am totally crazy about your doll stamps! Each one has her own personality and we can enjoy being creative with them! Shay is pretty sassy! Thanks so much Julie! I am crazy about your doll stamps! I love how each one has her own personality and that we can be so creative with each one. 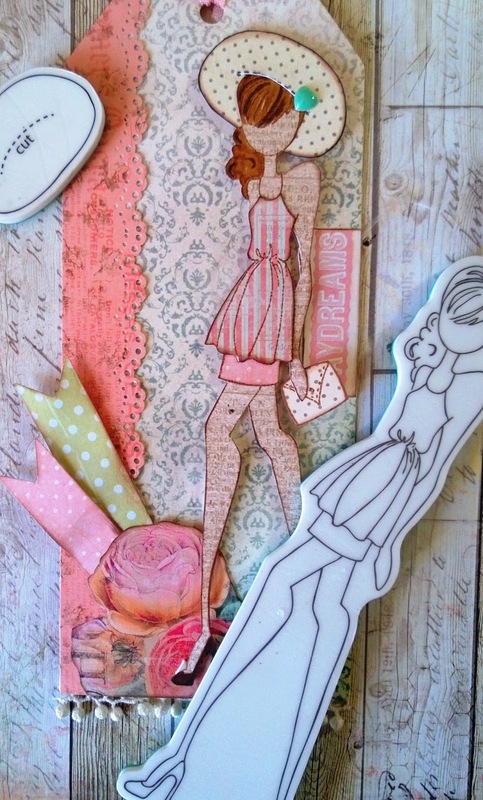 I look forward to seeing more of your creations on Live with Prima classes. Shay is definitely sassy! I love all the doll stamps you've made Julie. I'm hoping you will make die cuts for them. I want to make lots of them for my family and friends and dies cuts would truly make the task so much easier. I love your doll stamps! Hi Julie. My copy of your fabulous "Collage Couture" arrived today. It's the best craft book ever. Cheers. I just found your book while I was vacationing in the US. And I love it. You've got a wonderful talent and I'm inspired!